I’ve highlighted this striking little South Pas resident before, but I felt particularly compelled to bring him back to the blog. You see, he bears a striking resemblance to a character in a new book that everyone it talking about. I heard two girls raving about it at the train station. I received several email messages in the last few days from people wanting to know if it was true that I was friends with the author. It’s a road trip as well as a head trip about life, death, madness, reality, love, meaning, dreams, hope, despair, humor, microwave popcorn, parallel universes, happiness cults, jazz, quantum physics, connection and the ephemeral nature of existence led by a 16 year old boy, a hypochondriac dwarf, a punk rock fairy and, yes, a talking garden gnome. Don’t let the Young Adult classification throw you. This is a new classic along the lines of Catcher in the Rye and Don Quixote. (Only much more fun.) If you love John Irving, Douglas Adams, Kurt Vonnegut, Tom Robbins and Charles Dickens — read this book. 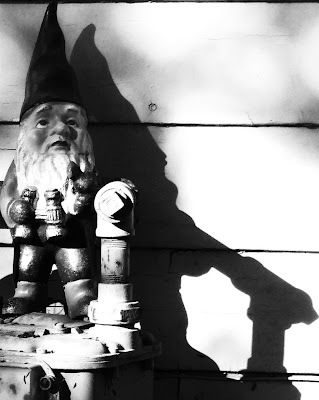 You’ll never look at a garden gnome the same way again.